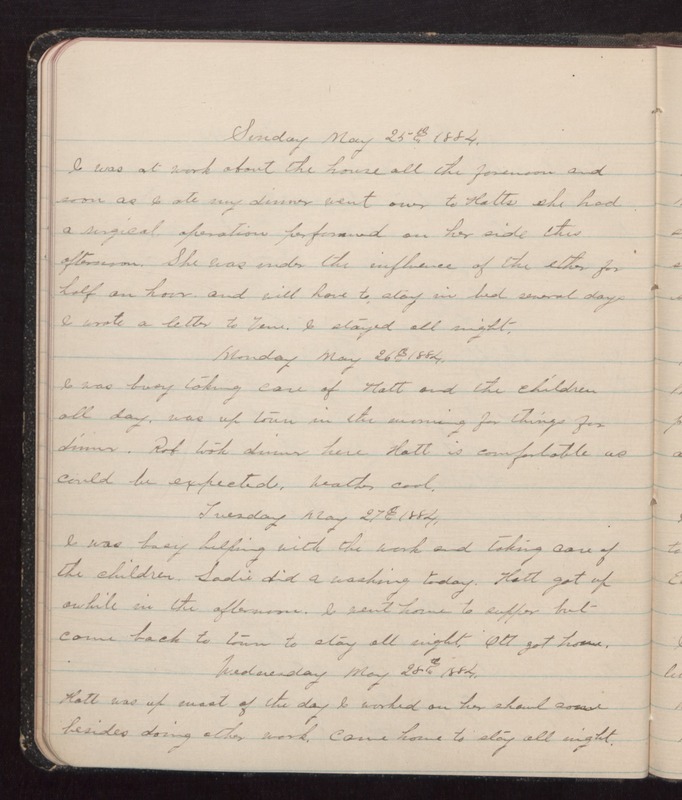 Sunday May 25th 1884. I was at work about the house all the forenoon and soon as I ate my dinner went over to Hatts she had a surgical operation performed on her side this afternoon. She was under the influence of the ether for half an hour, and will have to stay in bed several days I wrote a letter to Vene. I stayed all night. Monday May 26th 1884. I was busy taking care of Hatt and the children all day, was up town in the morning for things for dinner. Rob took dinner here Hatt is comfortable as could be expected. Weather cool. Tuesday May 27th 1884. I was busy helping with the work and taking care of the children. Sadie did a washing today. Hatt got up awhile in the afternoon. I went home to supper but came back to town to stay all night. Ott got home. Wednesday May 28th 1884. Hatt was up most of the day I worked on her shawl some besides doing other work, came home to stay all night.